Ten-story historic hotel convenient to uptown attractions, from $129. 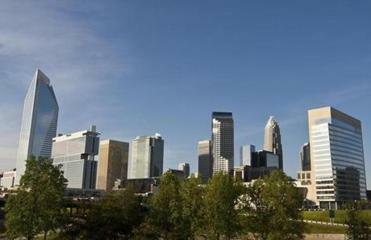 Democrats will wrangle over their platform in North Carolina’s largest city, which hungers to become a destination. The Queen City claims the state’s only Ritz-Carlton, from $299. Traces Charlotte’s history from mid 1800s to present. Admission $8, seniors $6, children ages 6-18 $5. Bechtler family collection includes works by Miró, Picasso, and Giacometti. Admission $8, seniors and college students $6, 11-18 $4. 400 East Martin Luther King Jr. Blvd. Chronicles history of stock-car racing. Admission $19.95, seniors and military $17.95, 5-12 $12.95. college students $8, 5-17 $5. Rotating exhibits preserve and promote African-American history and achievement. Admission $12, seniors, military, teachers, college students $10, 3-13 $8. Fifteen-barrel brewery helped launch a microbrew push in Charlotte. Strawberry gâteaux $5.79, almond tea cakes $1.29. Farm-to-fork restaurant in the Dunhill Hotel, entrees from $19. Not-for-profit restaurant serves Southern food with a community mission. Dinners from $18. Stylish new-American restaurant is the darling of the downtown scene. Dinners from $16.